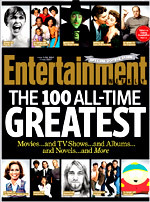 Entertainment Weekly's 100 All-Time Greatest Movies was printed in the magazine's July 5/12, 2013 double-issue. Exceptional US classics were cut from a similar 1999 Entertainment Weekly list, such as Raging Bull (1980), The Godfather, Part II (1974), Star Wars (1977), Snow White And The Seven Dwarfs (1937), Bringing Up Baby (1938), The Grapes of Wrath (1940), Sunset Boulevard (1950), Sherlock, Jr. (1924), The Philadelphia Story (1940), Swing Time (1936), Aliens (1986), The Bridge On The River Kwai (1957), Invasion of the Body Snatchers (1956), The Lady Eve (1941), The Third Man (1949), Airplane! (1980), The Bride of Frankenstein (1935), Beauty and the Beast (1991), To Be or Not to Be (1942), Funny Face (1957), Tootsie (1982), The Manchurian Candidate (1962), White Heat (1949), It's a Gift (1934), To Kill a Mockingbird (1962), The Producers (1968), Pickup on South Street (1953), Mildred Pierce (1945), The Shop Around the Corner (1940), and The Last of the Mohicans (1992). Great foreign films were dropped entirely from a similar 1999 Entertainment Weekly list, such as Jules and Jim (Jules et Jim) (1962) (Fr. ), 8 1/2 (Otto e Mezzo) (1963) (It. ), Children of Paradise (Les Enfants du Paradis) (1945) (Fr. ), Henry V (1944) (Br. ), The Conformist (1970) (It./Fr./WGer. ), M (1931) (Ger. ), Great Expectations (1946) (Br. ), Battleship Potemkin (Bronenosets Potyomkin) (1925) (USSR), Nosferatu (1922) (Ger. ), Diabolique (Les Diaboliques) (1955) (Fr. ), Blow-Up (1966) (Br. ), L'Age d'Or (1930) (Fr. ), Wings of Desire (Der Himmel uber Berlin) (1988) (WGer./Fr. ), Tokyo Story (Tokyo Monogatari) (1953) (Jp. ), Swept Away... (1975) (It. ), and Celine & Julie Go Boating (1974) (Fr.). There were 13 foreign-language films in the 2013 list. Only two animated films made the list: Disney’s Bambi (1942) (at # 14) and Pixar's Toy Story (1995) (at # 22). The earliest film in the top 100 was Sunrise (1927) (at # 30), while the most recent film was The Hurt Locker (2009) (at # 74). In Filmsite's opinion, the most startling films to appear on this 100 Greatest Movies list were Frankenstein (1931), All the President's Men (1976), American Graffiti (1973), Night of the Living Dead (1968), Dazed and Confused (1993), Woodstock (1970), Rushmore (1998), and Diner (1982), when one considers the rankings and what was missing.